It is determine by the position of the cuticle, the outermost part of our hair shaft, which consists of a layer of overlapping dead cells. This layer has two main functions: protect and hold. It protects the inner structures of the the hair from harsh elements and prevents water loss. How many types of porosity are there? There are three in total: low, normal and high. These are all determined by the structure of the cuticle, as mentioned earlier. The image below shows how the layers of the cuticle sit in normal, low and high porosity hair. 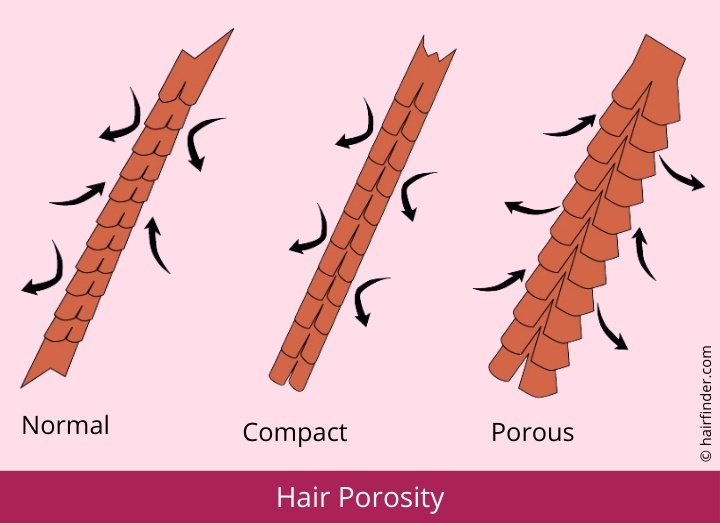 What are characteristics of each porosity? If you have normal porosity, consider yourself lucky, because it requires minimal maintenance. It easily draws in just enough water to hydrate your strands. This type of hair tends to be shiny, hold styles well and is easy to process (e.g. color, highlight, perm). An occassional deep conditioner and light protein benefits this type of hair. Think of your hair as a sponge. It can absorb its weight in water and easily allow all the water to escape. Cuticles of high porosity hair are raised and allow too much water to enter and escape the cortex, making it a challenge to retain moisture. This type of hair may be damaged, because of chemical processing. High porosity hair benefits from heavy creams, thick oils and butters, to seal in moisture. Also from routine protein treatments, which may help to fill in some of the gaps in the cuticle. Additionally, cold water rinses, low PH products such as diluted vinegar or aloe vera, help to seal the cuticle. This type of hair has flat, shingled cuticles. Picture a sponge inside a plastic bag. It often takes a while to wet and it seems to take forever to dry. Product buildup is a common complaint, as products just sit on top of the hair. Additionally, chemical processing is often long and difficult.With this hair porosity, once moisture is in it remains quite well. When well moisturized, this hair type is lustrous and shiny. One of the most effective ways to moisturize is using heat or steam to open up the cuticle and help the hair absorb moisture. Additionally, washing and rinsing the hair with warm water helps.